In Norway, voters will decide today whether to deliver prime minister Jens Stoltenberg a third term in government. Stoltenberg, in his eighth year of office, leads the center-left Arbeiderpartiet (Labour Party) that dominates Norway’s governing ‘red-green’ coalition. But while the center-right Høyre (literally the ‘Right,’ or more commonly, the Conservative Party) consistently led polls as the most popular party throughout the summer, Labour has caught back up in the polls, and the two are neck-in-neck to determine which will win the most votes today. 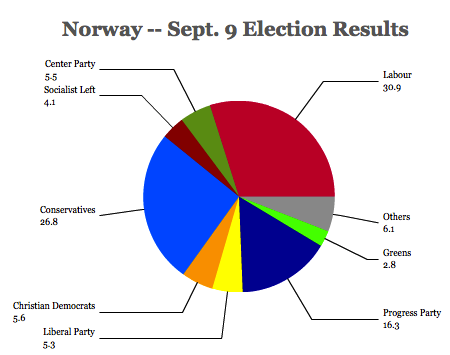 But even if Labour wins the largest share of the vote (as it’s done in every election since 1927), the Conservatives remain heavily favored to form Norway’s next government because the center-right parties, taken together, far outpoll the center-left parties. Labour’s two smaller allies, in particular, are faring poorly in polls. That means that Conservative leader Erna Solberg (pictured above, left, with Stoltenberg, right) is predicted to become Norway’s next prime minister with the support of the Folkeparti (Christian Democratic Party) and the Venstre (the Liberal Party), but also the Framskrittspartiet (Progress Party), a far-right, populist anti-immigration, anti-tax, anti-social welfare party formed in the 1970s. 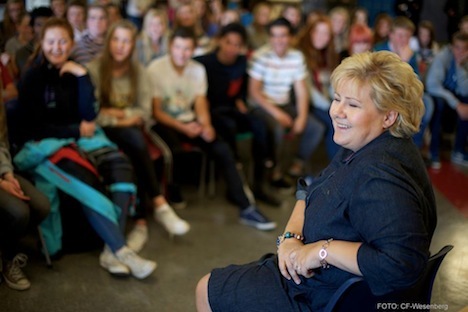 Solberg leads a party that’s undergone a major rebranding in recent years — Solberg, from western Norway, leads a relatively moderate center-right party that hopes to lower taxes but otherwise promises quite a bit of continuity with Stoltenberg’s policies. With a base in Oslo, the Conservatives are very business-friendly, and are likely to continue both the fiscal prudence of the Stoltenberg government (which diverts much of Norway’s annual budget surplus into its oil fund) as well as the social welfare state that’s come to define Norwegian government. 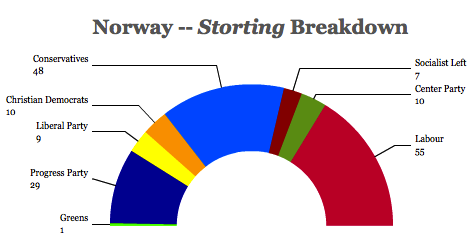 Although the Progress Party is currently the second-largest party in Norway’s Storting (Parliament), it’s never been part of a government in Norwegian history. So even though it’s likely to lose seats today, its leader Siv Jensen will have the votes to bring Solberg a broader right-wing majority — and to demand the finance portfolio, despite the fact that Progress has radically different views about Norway’s finances than Labour and the Conservatives. If Labour holds on, it will be due to Labour’s historically strong political base in the Norwegian heartland and its get-out-the-vote efforts, but also due to hesitation over putting the Progress Party in power, not any hesitation about Solberg. Norway, a country of just five million in Scandinavia, is one of the wealthiest countries in the world, with a GDP per capita of about $50,000 to $60,000, due in large part to Norway’s oil wealth. Voters will elect all 169 members of the unicameral Storting on the basis of proportional representation by choosing candidates from among 19 multi-member districts. The electoral threshold for entering parliament is 4% of the vote. Although Norway has twice rejected joining the European Union (most recently in a 1994 referendum), it is a member of the European Economic Area, so like Iceland and Liechtenstein, it is a member of the European single market, even though it doesn’t have any input on policymaking as a European Union non-member.